Hoping to make the most of the increased media attention given to athletes who identify as belonging to the LGBTQA community, Out To Win brings together all-star athletes and asks them to share their stories. Most have already been heard, but when combined they serve as a timeline for acceptance (or lack thereof) in a culture that still has a lot of growing up to do. Comprised almost entirely of archive footage and interviews, Out To Win is more or less a collection of stories from current and former athletes who chose to come out about their sexual preferences. The names run the gamut from iconic to contemporary, including Martina Navratilova, Billie Jean King, Jason Collins, Wade Davis, Brittney Griner, David Kopay, Charline Labonté, Conner Mertens, and John Amaechi. Each share their personal journey, as well as the struggles they face, and each closes their segment by discussing the relief and/or peace they felt after going public. There is no denying the timeliness of the topic being tackled in Out To Win, but it’s hard to fight the feeling that something more needs to be done. Filmmaker Malcolm Ingram is no stranger to the world of LGBTQA issues. In fact, he’s more or less built his entire career on his desire to document and share the big and small stories of this community with the world at large. He’s done a great job of gathering stories littered with moments worthy of any sports-related documentary for this feature, but he struggles to tie them all together in a meaningful and cohesive way. Each athlete wants change for sports as a whole, yes, but they also each seem very much concerned with their own profession. It’s not until the end that any real discussion takes place, and it’s a little too late to do much good. I do want to commend Ingram for his attempts to be as diverse and all-encompassing with this film as possible. He has men and women from various ethnic and cultural backgrounds, as well as representatives for every major sport. 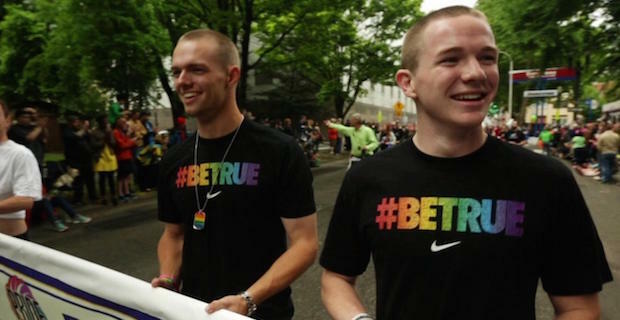 You might not know each athlete right away, but as you learn their story you begin to understand why their decision to be vocal about their sexual preference made such a meaningful impact on the movement towards equality in sports. Of the many who may very well be living closeted lives while playing in professional sports, these people chose to speak out, and with their voices united through the lens of Ingram their message is being received loud and clear. While I believe his work here falls far short of the game-changing heights many may have hoped it would hit, Malcolm Ingram has once again compiled a collection of truly remarkable stories for Out To Win. They may not change the world, but they do tell a story of evolution and acceptance within the world of professional sports that is continuing to develop today. Whether they help to further the cause or simply serve a way to better inform people of the current state of culture remains to be seen, but regardless these are stories everyone needs to hear.